Mallemat HA, Tewelde SZ. Pericardiocentesis. In: Roberts JR, Custalow CB, Thomsen TW, eds. Roberts and Hedges' Clinical Procedures in Emergency Medicine and Acute Care. 7th ed. Philadelphia, PA: Elsevier; 2019:chap 16. 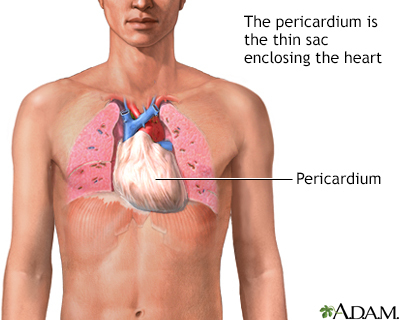 The pericardium is a thin double-layered sac which encloses the heart. Fluid is contained within the layers and lubricates the constantly rubbing surfaces. Cardiac tamponade is a condition involving compression of the heart caused by blood or fluid accumulation in the space between the myocardium (the muscle of the heart) and the pericardium (the outer covering sac of the heart). 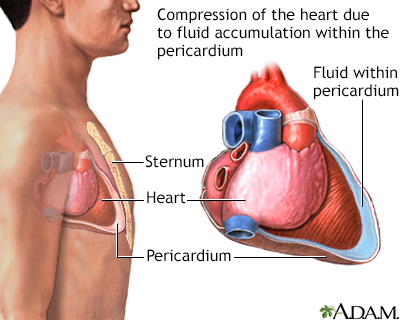 Blood or fluid collects within the pericardium. 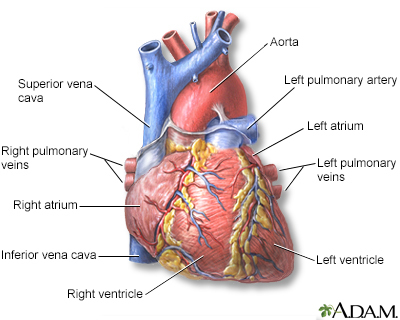 This prevents the ventricles from expanding fully, so they cannot adequately fill or pump blood. Cardiac tamponade is an emergency condition that requires hospitalization.